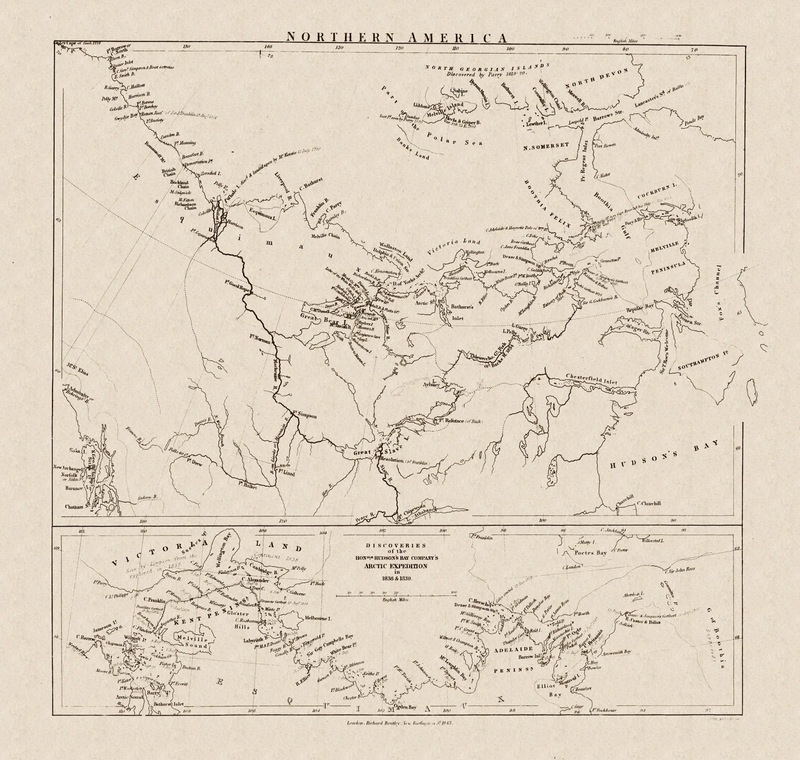 The well stocked libraries of Erebus and Terror in 1845 will certainly have included at least one copy of this fine engraving by John Arrowsmith - contained within Thomas Simpson's 1843 book: Narrative of the discoveries on the north coast of America: effected by the officers of the Hudson's Bay Company during the years 1836-39. 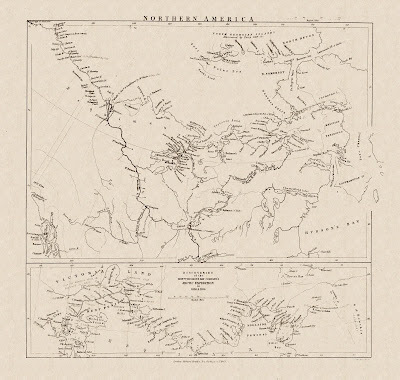 In compiling this map Arrowsmith was faced with the problem of reconciling some severe contradictions between longitude data from Dease and Simpson's 1839 expedition with the corresponding figures from George Back's 1835 decent of the Great Fish River. For Montreal Island the difference was nearly a whole degree. Arrowsmith cleverly solved this conundrum by using Dease and Simpson's geography combined with Back's latitude numbers for the main map (in which Montreal Island is shown to the East of Matty Island) while displaying Dease and Simpson's survey unadulterated in the lower panel (which has Montreal to the West of Matty). Later surveys by John Rae would confirm the veracity of Dease and Simpson's measurements. Other features which later proved to be erroneous are the presumed open water between the mouth of Back's River and the Gulf of Boothia and the isthmus, indicated by dotted lines, connecting King William Island and Boothia Felix. Franklin would, of course, have been driven to fill in as many of the blank spaces as possible, and to ink in or delete the dotted lines as appropriate. With the good state of preservation to be expected from the cold dark waters of Wilmot & Crampton Bay, it is not beyond the realms of possibility that such a corrected map may one day be revealed. Recently saw the Franklin exhibition at the National Maritime museum and spent a fantastic 5 hours there. Like you I'm a 18th and 19th century lover of all things maritime and especially interested in Darwin and Fitzroy. I'm going to spend a really enjoyable morning reading through your words and pictures. Thank you for all this you've worked really hard (enjoyable though it is). This map is extremaly interesting. Is it possible to get a higher resolution scan of it somewhere ?